We are in Milan, “Isola” district, on the sixth floor of a building of the ’70s that in many points of the façade was made of exposed concrete, in “brutalism” style. 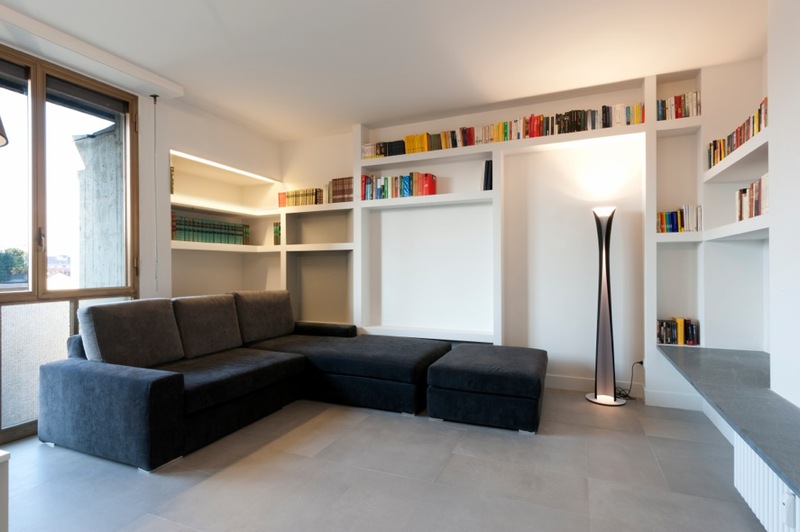 The apartment has been renovated, starting from the total demolition of all existing walls and the reconstruction of completely different environments from the original ones. The entrance area, expanded and open, develops from a square inclined at 45 ° to the façade walls. 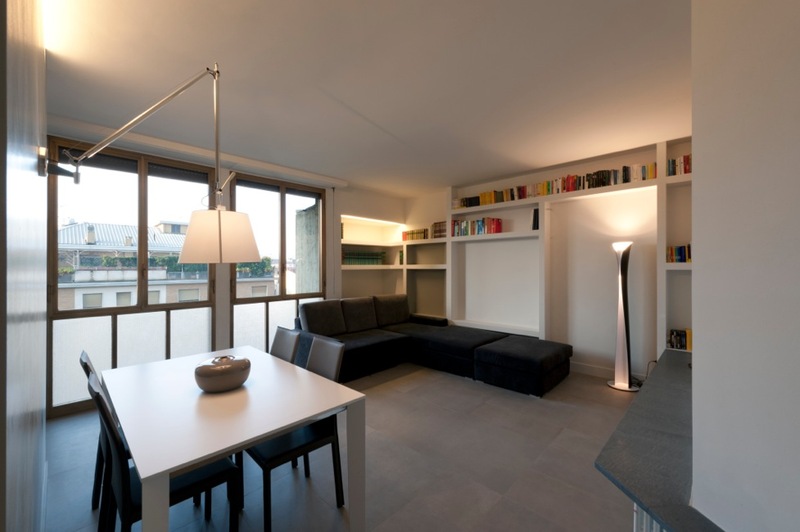 Brightness, openness and flexibility of the spaces are at the origin of the architect Tommaso Giunchi’s project. The character of the building and of the client guided the interior stylistic choices, bearing in mind the request to use practical and resistant materials. Hence the decision to create a “cold” box, which was then heated with the furnishing elements. 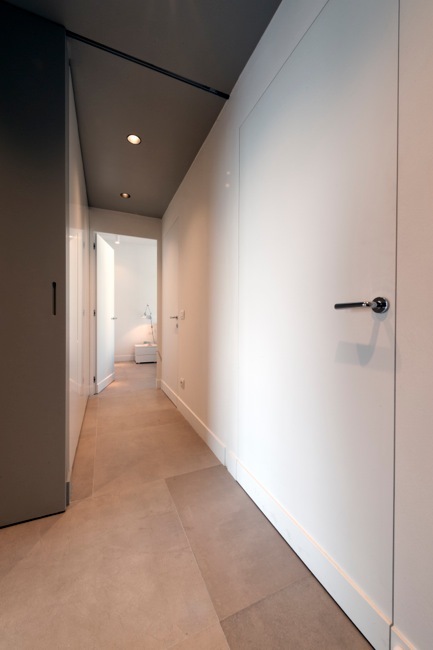 The surfaces and colors recall the gray color of the cement, with some warmer tips in the enamel of the entrance walls and in the lining of some parts of the bathroom. 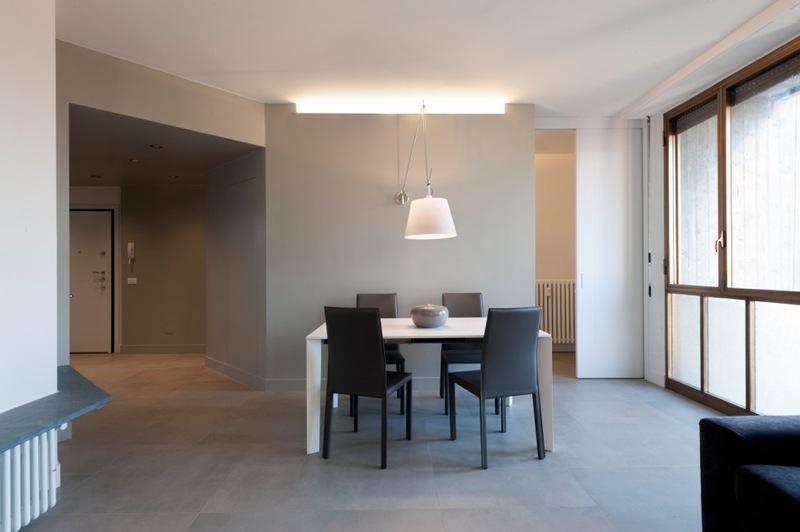 To give continuity and uniformity to the space, the floor of the entire house was covered with a single material, fine porcelain stoneware by Floor Gres, “Industrial” series, “Sage” color, “Natural Matt” finish, giving dynamism with the double format 80×80 cm and 40×80 cm in a composition that recalls the diagonality of the entrance walls. 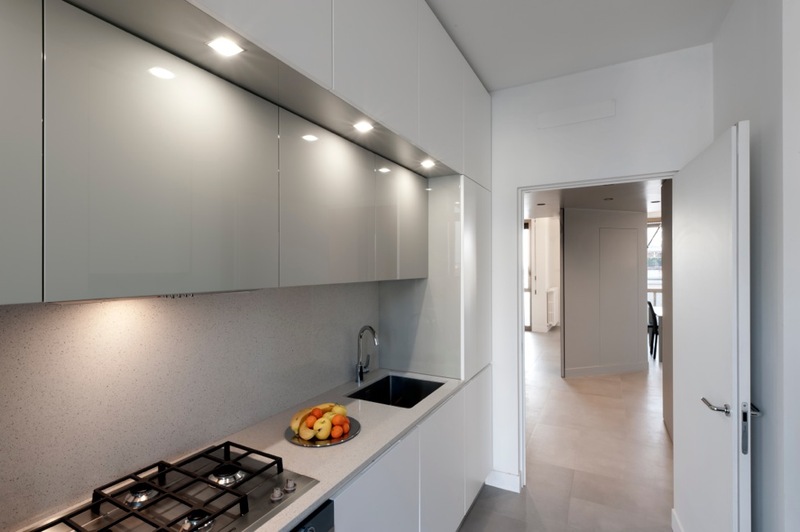 Modernity and simplicity characterize this neutral and linear surface, which lends itself to be used in a transversal, effective and captivating way in every architectural project. The square at the entrance, inclined 45 °, generates a physical and visual communication between the spaces that seem to belong to a single environment while emphasizing the difference of the premises. When entering the house, the look is naturally conveyed to the room and to the large window openings, which are like a picture of the urban landscape. 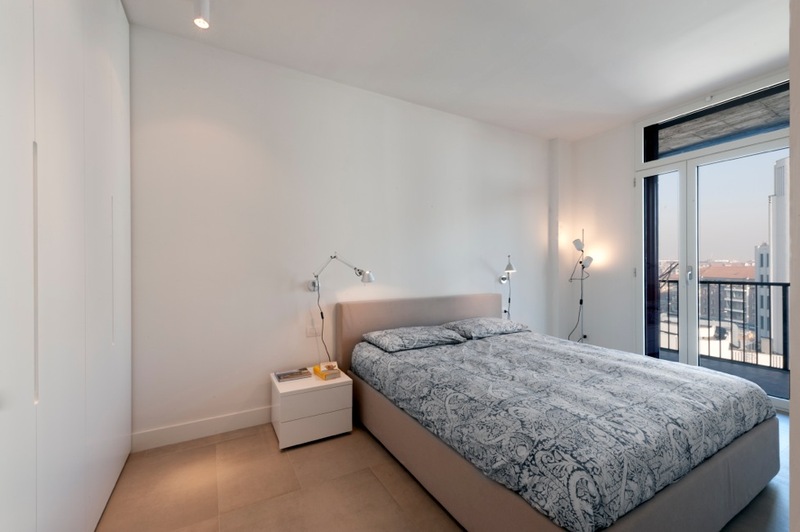 The sleeping area, bedroom, master bathroom and hallway, is separated by a full-height sliding door. The rest of the house is apparently all open and communicating, and this helps to exploit even visually all the generous size of the apartment. 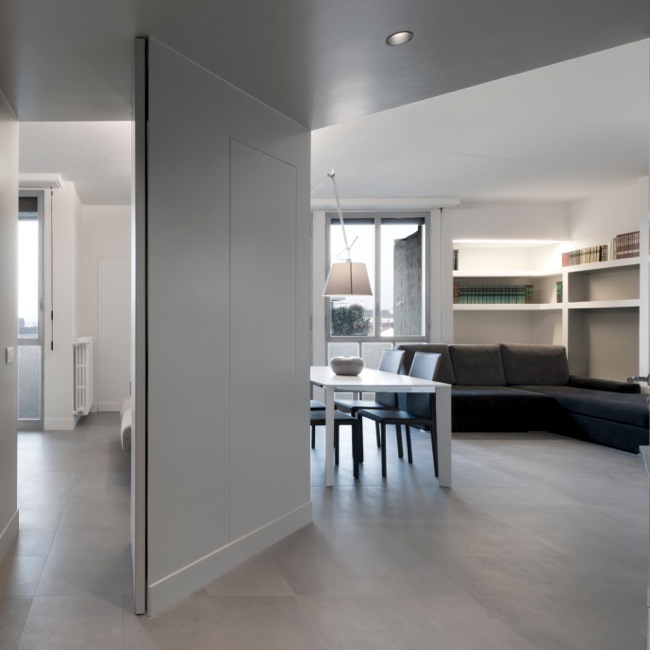 A satin-wall door (wider than the standard) allows to close the kitchen environment; a pivoting door and a large full-height sliding panel hidden in the wall allow to separate the second bedroom / study from the living room. Also for the bathrooms, the porcelain tile floor Gres, “Industrial” series, but the color changes: for the small “Ivory” bathroom with “Soft” finish, in the 20×80 cm format, while for the large bathroom, the color “Ivory”, used in the left wall, was combined with the “Moka” color used to characterize the inside of the shower and the “Sage” color for the right wall, playing with the 40×80 cm, 80×80 cm and 20×80 cm formats . As a whole, neutral shades that, combined with each other, help to give harmony and balance to the composition. 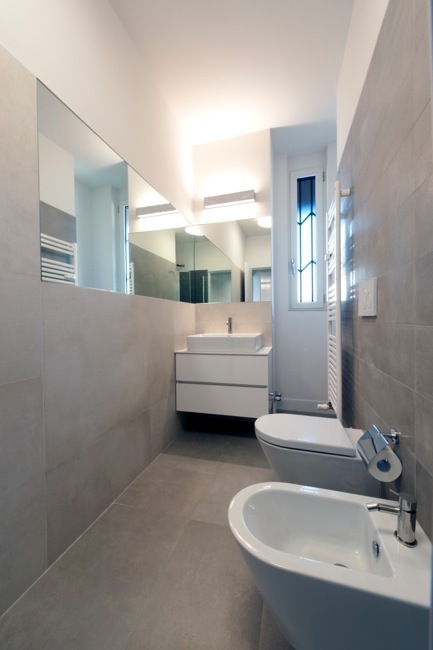 – small bathroom wall: Floor Gres, “Industrial” series, “Ivory” color, 20×80 cm, “Soft” finish. 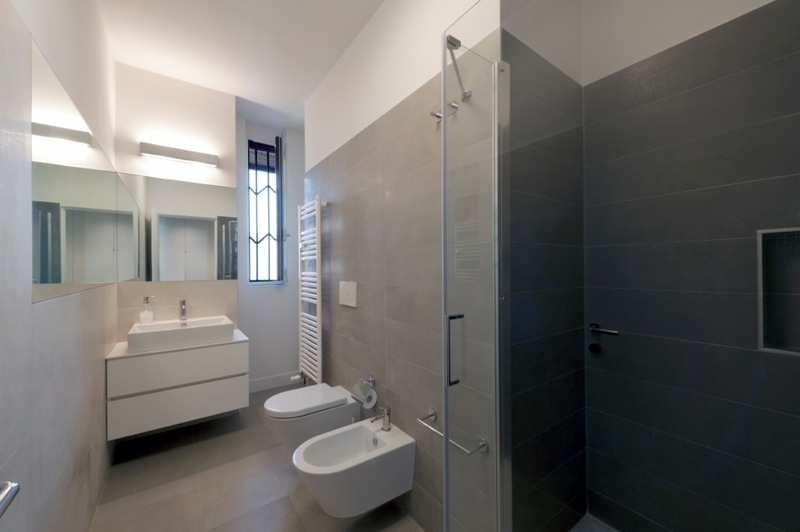 – large bathroom wall: left wall, Floor Gres, “Industrial” series, “Ivory” color 40×80 + 80×80; right wall color “Sage” 20×80 cm; internal shower “Moka” color 20×80 cm; “Soft” finish.